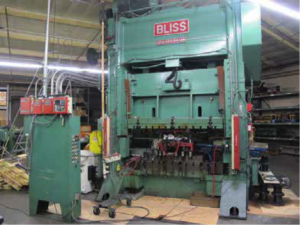 Bliss HP2-500-84X48 500-Ton Straight Side Stamping Press s/n C50355-2 w/ Bliss Controls, Data Instruments SmartPAK Wintriss Press Automation Control, AutoSetPAC, Wintriss Load Analyzer, (2) Programmable Cam Outputs, DiPRO and DSI2 Sensor Interfaces, Air Pressure Die Balance, 30-60 Strokes/Min, 6” Stroke, 6” Slide Adj, 18” Shut Height, 84” x 48” Bolster, COE “Servo Master Series” mdl. CPRF-S424 24” Feeder with Digital Controller. Minster P2-150-48 “Piece Maker” 150-Ton Straight Side Stamping Press s/n P2-150-17189 w/ Minster Controls, Data Instruments SmartPAK Wintriss Press Automation Control, Wintriss Load Analyzer, DiPRO Sensor Interface, Shadow 8 Light Curtain, Air Clutch, 75-150 Strokes/Min, 5” Stroke, 4” Slide Adj, 23” Shut Height, 40” x 48” Bolster, Littell 18” Mechanical Feeder, Cooper-Weymouth 24” Straightener/Feeder, Perfecto mdl. 24-48-2500POR Coiler. Minster P2-100-42 “Piece Maker” 100-Ton Straight Side Stamping Press s/n P2-100-24660 w/ Minster Controls, Data Instruments DiPRO 1500 Wintriss Die Protection, Wintriss Load Analyzer, Shadow VII Light Curtain, Air Clutch, Counterbalance 97 Sq/In, 0-300 Strokes/Min, 3” Stroke, 4” Slide Adj,26” Shut Height, 31” x 42” Bolster. Minster P2-100-42 “Piece Maker” 100-Ton Straight Side Stamping Press s/n P2-100-12004 w/ Minster Controls, Honeywell SmartPAK Wintriss Press Automation System, Wintriss Load Analyzer, Wintriss DSI2 Sensor Input Module, Shadow IV Light Curtain, Air Clutch, 2” Stroke, 4” Slide Adj, 31” x 42” Bolster, Littell 14” Mechanical Feeder, US Tool No.9 Mechanical Slide Feed. Verson 7 ½ OBG 105-Ton Open Back Gap Stamping Press s/n 19907 w/ Air Clutch, 8” Stroke, 4” Slide Adj, 18” Shut Height, 35 Strokes/Min, 30” x 39” Bolster, Verson Type K1614-4 17.7-Ton Cushion, Bijor Lubrication System, CAO mdl. CF-400 12” x 18” Air Feeder, Littell mdl. 418-7PDS 18” x .050” Straightener/Feeder, Littell 18” x 40” Coiler. Verson 7 ½ OBG 105-Ton Open Back Gap Stamping Press s/n 7570 w/ Air Clutch, 8” Stroke, 4” Slide Adj, 18” Shut Height, 35 Strokes/Min, 30” x 39” Bolster. Aida 8 mdl. C1-8(1) 80-Ton Stamping Press w/ Data Instruments SmartPAK Wintriss Press Automation Controls, DiPRO Sensor Interface, Programmable Cam Outputs, Die Weight Air Balance, 40-115 Strokes/Min, 3.93” Stroke, 3.15” Slide Adj, 9.84” Shut Height, 23.62” x 52.36” Bolster, Rapidair 8” x 10” Air Feeder, Durant mdl. MDW-0057 Wire Straightener/Feeder, 3500 Lb Cap Wire Uncoiler. Minster 6 60-Ton OBI Stamping Press s/n 6F-16606 w/ Data Instruments SmartPAK Wintriss Press Automation System, DiPRO Sensor Interface, Programmable Cam Outputs, 180 Strokes/Min, 4” Stroke, 3” Slide Adj, 16” Shut Height, 14” x 21” Bolster, PA Industries SRF-210 8” Feeder, Cooper-Weymouth mdl. 12BCS 5000 Lb Cap 12” x 48” Coil Cradle. Minster 6-101 Flywheel Type 60-Ton OBI Stamping Press s/n 6-101-20931 w/ 90-180 Strokes/Min, Air Clutch, 3” Stroke, 2.75” Slide Adj, 13.5” Shut Height, 21” x 32” Bolster, Jack Style Incline Adj, Rapidair 12” x 16” Air Feeder. Minster No. 6 60-Ton OBI Stamping Press s/n 6-10544 w/ Air Clutch, 4” Stroke, 3” Slide Adj, 21” x 32” Bolster. Bliss C45 45-Ton OBI Stamping Press s/n H69381 w/ Data Instruments SmartPAK Wintriss Press Automation System, Air Die Balance, Air Clutch, 3” Stroke, 3” Slide Adj, 12 ¼” Shut Height, Rapidair 6” x 10” Air Feeder, Cooper-Weymouth 12” Straightener/Feeder. Bliss 45-Ton OBI Stamping Press s/n H-67522 w/ Air Clutch, Air Pressure Balance, 80-160 Variable Strokes/Min, 3” Stroke, 3” Slide Adj, 12 ¼” Shut Height, 18” x 30” Bolster. Minster No. 5 45-Ton OBI Stamping Press s/n 5-10095 w/ Air Clutch, 3” Stroke, 2 ¾” Slide Adj, 18” x 28” Bolster. Bliss 35-Ton OBI Stamping Press s/n H67640 w/ Air Clutch, 2 ½” Stroke, 3” Slide Adj, 10 ¾” Shut Height, 17” x 26” Bolster. Bruderer BTSA25 30-Ton High Speed 4-Post Stamping Press s/n 3828 w/ Bruderer Controls, Tyco Wintriss Controls, 100-1500 Strokes/Min, ½”-1 ½” Stroke, Air Clutch, 17” x 21” Bolster, Mechanical Feeder. Bruderer BTSA25 30-Ton High Speed 4-Post Stamping Press w/ Bruderer Controls, Tyco Wintriss Controls, 100-1500 Strokes/Min, ½”-1 ½” Stroke, Air Clutch, 17” x 21” Bolster, Mechanical Feeder. Dallas mdl. CODE#06090 12”x48”x2500# Cap Coiler s/n 15941. Regal mdl. 1500-12SRP 1500 Lb Cap x 12” Motorized Coiler s/n 18994. Regal mdl. 1500-12-SRP 1500 Lb Cap x 12” Coiler. (2) Regal mdl. 750-12-SRP Motorized Coilers. American Steel Line mdl. 1000 600 Lb Cap Coiler. Cooper-Weymouth 18” Coil Cradle w/ Straightener/Feeder. Cooper-Weymouth 12” Coil Cradle w/ Straightener/Feeder. Cooper-Weymouth 8” Coil Cradle w/ Straightener/Feeder. Littell mdl. 212-17PD 12” Straightener/Feeder. Benchmaster mdl. 910SS 10” Straightener/Feeder. Richmond “600 Group” VMC 1000 CNC Vertical Machining Center s/n CV0070 w/ Fanuc/Richmond Controls, 20-Station ATC, CAT-40 Taper Spindle, 8000 Max RPM, Hand Wheel, 20” x 44” Table, Coolant. 1996 Mitsubishi CX-20 CNC Wire EDM Machine s/n 0662 w/ Mitsubishi WIICX Controls, 6-Axis Simultaneous Controls X, Y, U, V, and Z, Graisen Tooling System, Dielectric Cooling and Filtration System. Bridgeport Vertical Mill s/n 256910 w/ Acu-Rite MillMate DRO, 2Hp Motor, 60-4200 Dial Change RPM, Chrome Ways, Power Feed, 9” x 42” Table. Bridgeport Vertical Mill s/n 256753 w/ Acu-Rite MillMate DRO, 2Hp Motor, 60-4200 Dial Change RPM, Chrome Ways, Power Feed, 9” x 42” Table. Bridgeport Series 1 – 2Hp Vertical Mill s/n 227600 w/ Acu-Rite MillMate DRO, 60-4200 Dial Change RPM, Chrome Ways, Power Feed, 9” x 42” Table. Lagun FTV-1 Vertical Mill w/ Tri-Onics Mini-II DRO, 2Hp Motor, Dial Change RPM, Power Feed, 9” x 42” Table. Bridgeport Vertical Mill s/n 189064 w/ Mitutoyo DRO, 1Hp Motor 80-2720 RPM, Chrome Ways, Power Feed, 9” x 42” Table. Bridgeport Vertical Mill w/ 1Hp Motor, 80-2720 RPM, Power Feed, 9”” x 42” Table. Victor 1640 16” x 40” Geared Head Gap Bed Lathe s/n 56309 w/ 32-1800 RPM, Inch/mm Threading, Tailstock, Steady Rest, 5C Collet Closer, Mack Tool Post, 10” 4-Jaw Chuck, 8” 3-Jaw Chuck. Standard-Modern 13” x 32” Geared Head Second OP Lathe s/n 4983 w/ 50-1500 RPM, Tailstock, 5C Collet Closer, KDK Tool Post, 8” 4-Jaw Chuck, 8” 3-Jw Chuck. Jones-Shipman 540H 6” x 18” Automatic Surface Grinder s/n 101053 w/ PG Ltd Precision Optical Radius Dresser, Walker Fine-Line Electromagnetic Chuck. Jones-Shipman 540H 6” x 18” Automatic Surface Grinder s/n 101052 w/ PG Ltd Precision Optical Radius Dresser, Walker Fine-Line Electromagnetic Chuck. Brown & Sharp 824 Micromaster 8” x 24” Automatic Surface Grinder s/n 523-824-860 w/ Fine-Line Electromagnetic Chuck, 12” Wheel Cap, Coolant. Boyar Schultz Challenger H612 6” x 12” Surface Grinder s/n 28660 w/ Boyar Schultz High Speed ID Grinding Attachment, Walker Fine-Line Electromagnetic Chuck. Boyar Schultz Challenger H612 6” x 12” Surface Grinder s/n 25322 w/ PG Ltd Precision Optical Radius Dresser s/n 4454, LBP Fine-Line Electromagnetic Chuck. Boyar Schultz Challenger H612 6” x 12” Surface Grinder s/n 25318 w/ LBP Fine-Line Electromagnetic Chuck. Boyar Schultz Challenger H612 6” x 12” Surface Grinder s/n 22311 w/ Magnalock Fine-Line Electromagnetic Chuck. Abrasive Machine Tool No. 1 ½ 10” x 15” Surface Grinder w/ Magnetic Chuck. Taft-Peirce 5” x 12” Surface Grinder w/ Walker Fine-Line Electromagnetic Chuck. Asquith mdl. FS-5729 36” Radial Arm Drill s/n OD1-11333 w/ 31-830 RPM, 3X Gearbox 90-2490 RPM, Power Column and Feeds, 33” x 42” x 20” Fixture Table, Coolant. Hansvedt SM-160B Die Sinker EDM Machine s/n 26345 w/ Hansvedt 150B Power Source, Coolant System, Maple-Top Work Bench. Sunnen MBB-1600 Precision Honing Machine s/n 45331 w/ Mandrels, Stones and Truing Sleeves. Grob 24” Vertical Band Saw w/ Blade Welder. Powermatic mdl. 87 20” Vertical Band Saw w/ 50-4500 Dial FPM, Blade Welder. Johnson mdl. J 10” Horizontal Band Saw s/n J-14542. Famco mdl. 652 52” Kick Shear. Enco 48” Pan Brake s/n 900066. Nugier mdl. H40-7 40-Ton Sliding Ram H-Frame Press s/n 4809093. Snow mdl. MV-18T Automatic Lead Screw Tapping Machine s/n M42938-1293. (2) Edlund mdl. 2F-15 Deep Hole Drill Presses w/ 100-2400 Variable Speed RPM, 24” x 38” Table. Columbia 12-Speed Pedestal Drill Press. Rockwell 6” Belt / 12” Disc Sander w/ Stand. (2) Torit mdl. 84 Dust Collectors. Kelco mdl. CS21C Dry Blast Cabinet. Rice/Milwaukee mdl. FS Die Filer. Lincoln Weld-PAK 175HD Arc Welding Power Source. Sullair mdl. 20-100H-ACAC 100Hp Rotary Vane Air Compressor s/n 003-86164. Sullair mdl. 16-75 75Hp Rotary Vane Air Compressor. Sullair mdl. SRD-830AC Refrigerated Air Dryer. 250 Gallon Air Storage Tank. Clean-Sweep Air Systems mdl. RC-811766/371 Air Handling System. Water Reclamation System w/ Tanks, Filters and Pumps. Roto-Finish “Spiratron” 35 Cu/Ft 112” Hydraulic Media Tumbler w/ LMI Media Control Package. Sweco mdl. FMD-14LR 15 Cu/Ft 57” Media Tumbler. Speed-D-Burr mdl. SMHSB 7.5 Cu/Ft Media Tumbler s/n 6001 w/ Separation and Recovery Table. PFS 7.5 Cu/Ft 48” Media Tumbler w/ LMI Media Control Package. Sweco mdl. FMD-7LR-2 7 Cu/Ft 44” Media Tumbler. BMT “Multibarrel” mdl. 2MB-200 6-Barrel Slide Hone Finishing Mill s/n 378. (2) New Holland mdl. K-24 Spin Dryers. Automated Finishing 21” Pass-Thru Wash Line w/ Wash, Rinse and Heat Cycles, Mist Collector. Harig Grind-All No.`ion Grinding Fixtures. Suburban 6” x 6” Magnetic Sine Chuck. 4” x 4” Magnetic Sine Chuck. Drills, Taps, Endmills, Reamers and Perishable Tooling. ROI OMIS II Video Inspection System w/ ROI Optical Video Probe, Panasonic Monitor and Synchronous Crosshair Generator, Dual Light Sources, Table. Nikon mdl. V-12 12” Optical Comparator w/ Nikon MC-102 DRO, 20X-50X-100X Lenses, Stand. Jones & Lampson 14” Floor Model Optical Comparator w/10X-20X-31.25X-50X-62.5X-100X Selectable Magnification, Surface and Profile Illumination. Jones & Lampson 14”Floor Model Optical Comparator w/ Acu-Rite Qwikcount DRO, Surface and Profile Illumination. Wilson mdl. 4JR Rockwell Hardness Tester. Wilson Rockwell Hardness Tester s/n 568. Mitutoyo TM-111 Tool Makers Microscope. Linitron and Bausch & Lomb Microscopes. Brown & Sharpe “Data-Hite” 18” Digital Height Gage. (2) 24” Dial Height Gages. Mitutoyo 24”, 18” and 12” Vernier Height Gages. Mitutoyo 6”-12” OD Mic Set. Starrett 6”-12” OD Mic Set. Lufkin 0-6” OD Mic Set. Mitutoyo and Starrett OD Mics. Brown & Sharp Bore Mics. Mitutoyo 6” and 12” Dial Calipers. Meyer .061-.0615 to .500-.5005 Pin Gage Cabinet. Mitutoyo Digital Indicator w/ Granite Base. Standridge 36” x 48” x 6 ½” Granite Surface Plate w/Stand. 30” x 48” x 6” Granite Surface Plate. Standridge 24” x 36” x 4” 2-Ledge Granite Surface Plate w/ Roll Stand. Standridge 24” x 36” x 4” Granite Surface Plate w/ Stand. 1996 Ford Ranger XL Pickup Truck w/ 2.3L Gas Engine, 4-Speed Manual Trans, 151,569 Miles, VIN# 1FTCR10A5TUA80166. Komatsu FG30S 5600 Lb Cap LPG Forklift s/n 172611 w/3-Stage Mast, 185” Lift Height, Cushion Tires. Komatsu FG30ST-4 5400 Lb Cap LPG Forklift s/n 175817 w/ 169” Lift Height, Side Shift, Cushion Tires. Clark CGX25 4000 Lb Cap LPG Forklift s/n GX230-0319-7960KOF w/ 3-Stage Mast, 188” Lift Height, Cushion Tires. Komatsu FR18S 3500 Lb Cap Stand-In Electric Pallet Mover s/n FRS30-13962002 w/ 240” Lift Height, 36V, Charger. Economy “Hi-Jacker” 300 Lb Cap Man Lift. (5) Big Joe mdl. 1056 1500 Lb Cap Electric Die Lifts. (2) T & S 1000 Lb Cap Hydraulic Barrel Lifts. Downs 2-Ton Portable A-Frame Gantry w/ Dayton Electric Hoist. Die Tables 4’ x 6’ and 4’ x 8’. (34) Sections of Pallet Racking. Material Racks and Die Racks. NCI 5000 Lb Cap Digital Platform Scale.